The Depth Charge remained the principal anti-submarine weapon in both World Wars. Although aircraft versions were developed prior and during World War II, only one non-Soviet submarine was possibly sunk by aircraft and another shared with surface ships. Surface ships accounted for twelve submarines in addition to the one shared with aircraft. Information on Soviet submarine losses are unreliable even now, but, omitting harbor or stranded losses, it appears that about five were sunk by aircraft and about 18 by surface vessels. World War II DC had six depth settings for each type, running from 49-82 feet (15-25 m) up to the maximum depths listed below. The depth was controlled by a time fuze. No magnetic (influence) or other triggers were ever developed. The maximum destructive radius against a 0.5" (12 mm) hull were 26 feet (8 m) for the WBD and 18 feet (5.6 m) for the others. WB = "Wasserbombe" or Depth Charge. There were several ASW weapons under development in 1945, including long-range mortars and rockets, but none appear to have seen service. Post-war, Germany has used USA and other NATO ASW munitions. "Blind Time" is the time between when a weapon is launched and when it reaches the target location. In addition, most early sonar systems lost the target submarine on close approach, usually requiring a "sprint" to reduce blind time. For depth charges, this meant that they were dropped or fired after the sonar contact was lost. World War II destroyers were designed with four DC throwers abreast the after superstructure and two racks on the port and starboard quarters. Up to 1939, only 18 DCs were carried, with six of these being in the racks. These numbers were increased once the war started. For example, on her surrender in 1945, the Z33 carried thirty lightweight DC with four throwers. The only depth charge used by the Germans during World War I. Produced by Carbonit Gesellschaft, this used a float with a lanyard with a back up timer device. This DC worked only about 50% of the time, and the Navy considered it to be too heavy for the charge weight. It was also faulted for having too slow a sink rate and being difficult to manufacture. Only 2,256 were produced during the War. Developed prior to World War II. 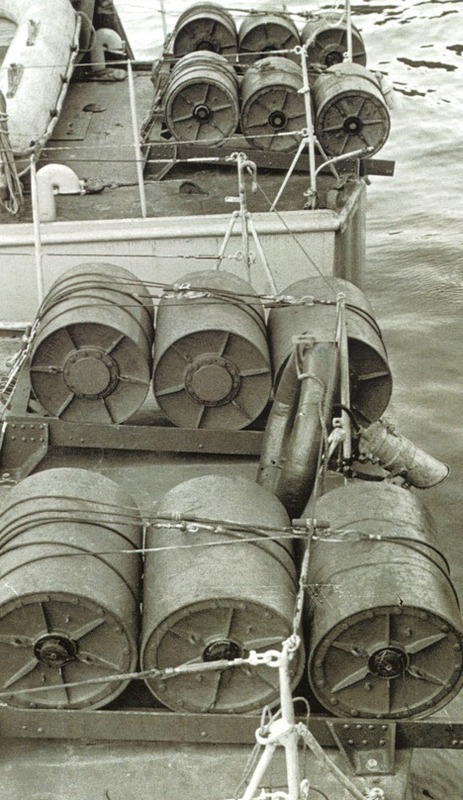 German WBG Depth Charges on S-Bootes. These are identified in the source document as "DM 11 Anti-Submarine Grenades" but I believe them to be WBG type. Établissement de Communication et de Production Audiovisuelle de la Défense (ECPA D) Photograph. Designations are not available at this time. It would appear that stern racks held three DC and that smaller vessels had several single DC holders arranged along the sides of the after superstructure. Most were single DC throwers, similar to Allied versions. A Rheinmetall drawing shows a weight of 606 lbs. (275 kg), initial velocity of 115 fps (35 mps) and an arbor weight of 77 lbs. (35 kg).